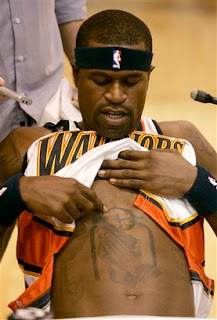 Stephen Jackson‘s past might not have put him in that category, but his future certainly will. who thinks that starting a piece with the webster’s definition of the word you’re talking about is a good idea? it’s been used as a joke so much (at least five time on the simpsons alone), that if this is supposed to be a joke, it isn’t a very funny one. i beginning to think that the biggest problem with espn is laziness. they already dominate sports, so they don’t even try. if you’re doubting me, try watching the monday night football post-game report. they just make it up.